Currently sifting through the 1,000+ photographs (and videos) I took during my 5-day stay in Cambodia. Yes, I know – A THOUSAND PHOTOS?? This may take a while. Haha! I wanted to share this particular moment, though. 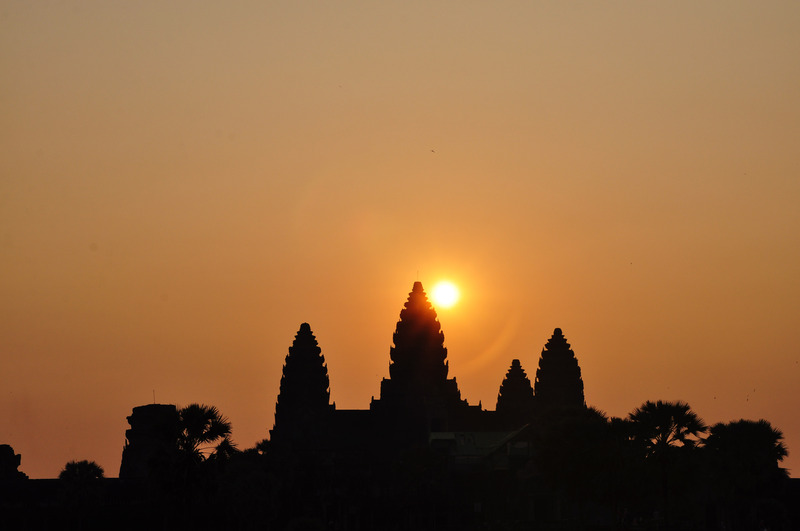 One of the highlights of my trip was the sunrise in Angkor Wat. We woke up at around 4:30 in the morning and our Tuk Tuk driver picked us up from the hotel at 5:20. It was still dark when we arrived at the temple – you could stumble or fall on the uneven stone path if you weren’t careful. One woman who was walking behind us quickly veered to the right and then backed away just as suddenly when she realized that she was close to the edge of the walkway. Had she gone a few inches further she would’ve fallen into the moat! My friends and I walked side by side, making jokes about zombies attacking us as we passed under the archways that marked the entrance to the temple. It was comforting to know that there were other tourists around us. Angkor Wat was covered in darkness and the lights that shone from people’s flashlights reminded us that we weren’t alone – that there were other people who were as crazy as us to get up at 4 in the morning and stand and wait for more than hour to watch the sunrise. It’s funny, looking at the photograph above you would think that there was only the temple, the sun and I – all three of us sharing an intimate moment. It’s as if the first few minutes of daylight were meant for me, and only me, when in fact I shared that moment with a large group of tourists, all eager to capture a perfect shot of that magnificent sunrise. Somehow I had gotten separated from my friends while looking for a good spot near the temple and found myself surrounded by strangers. I heard the rapid clicks of cameras, and every now and then someone would ask instructions on how to get the right settings for a sunrise shot. I myself took several photos, nervous that I would mess up this one crucial shot. When I wasn’t clicking away, I found myself gazing at the throngs of people sitting or standing by the side of the water. I looked back at the towering spires of the temple, which were constructed to look like closed Lotus flowers, and wondered how beautiful this sunrise would be. Imagine the pressure on this one historical site. All these people from different parts of the world made the extra effort to wake up at an ungodly hour and wait patiently for something, praying it would be worth it. At 6:30 I was getting impatient. Where’s the sun? When will it rise? The sky’s already bright and blue, are we sure it’s rising here? But a few minutes later I saw the bright yellow tip peeking out from behind the temple. I squealed (a little too loudly) and raised my camera, just as everyone else lifted theirs. Click! Click! Click! they went. I realized I was doing too much clicking and less seeing. In between shots I put my camera down to fully appreciate the brilliance of the rising sun. I couldn’t help but smile as the sky took on an orange hue, the soft light creeping across the rippling waters and the grassy fields, illuminating what just an hour ago was bathed in darkness. It was breathtaking. And most definitely worth it. 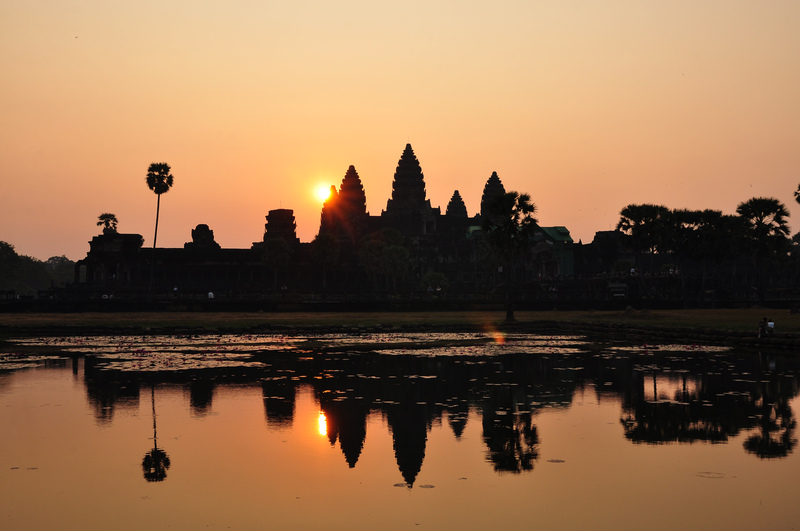 As the sun rose steadily behind Angkor Wat, I became immensely aware that I was in a country far away from my own – it dawned on me: I’m here in Cambodia! I’m here witnessing this spectacle. I’m in front of this massive, magnificent structure with the most beautiful sunrise I’ve ever seen. This is really happening. I remained standing despite my aching feet, relishing that triumphant feeling. I was completely surrounded by people but for a moment, it felt like there was just the sun, the temple, and me. I had the same feeling when I was waiting for the sun to come out behind Angkor Wat. I said to myself that I only need to get one perfect shot. Then time for me to experience it all with my own eyes. Keeping it in a photo is the best takeaway you can have but nothing beats the moment when you just stop clicking and just enjoy the moment and relive all the emotions you felt while you watch as the sun rises. The same way why I hate taking videos in concert—let them take their videos I’ll enjoy this moment and watch your videos later. Hi Nate!!!! Thanks for reading 😀 Suuuper ganda ng sunrise. Gah!! Angkor – sunrise, year 2000, new year’s day. Pavarotti sang here – it must have been amazing. I really like your writing, and also your willingness to try local words, and see things not as a tourist. Cambodia is full of little moments, little nuances that are so easy to miss when your eye is stuck behind the viewfinder.